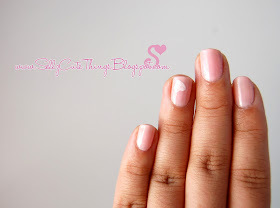 How to Get Perfect Shapes on your Nails Update! I made an update for the "How to get perfect shapes on your nails" Post (original). It's a much simpler design and has very easy to follow steps. I also created this little mini quick reference "cheat sheet" for the steps. These are the materials you will need. 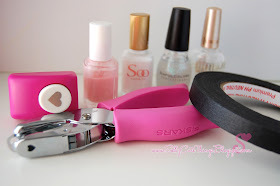 Hole Puncher(s) I found smaller heart one at the dollar store, Nail polishes and masking tape (painters tape works also and I find it easier to work with thin tape). 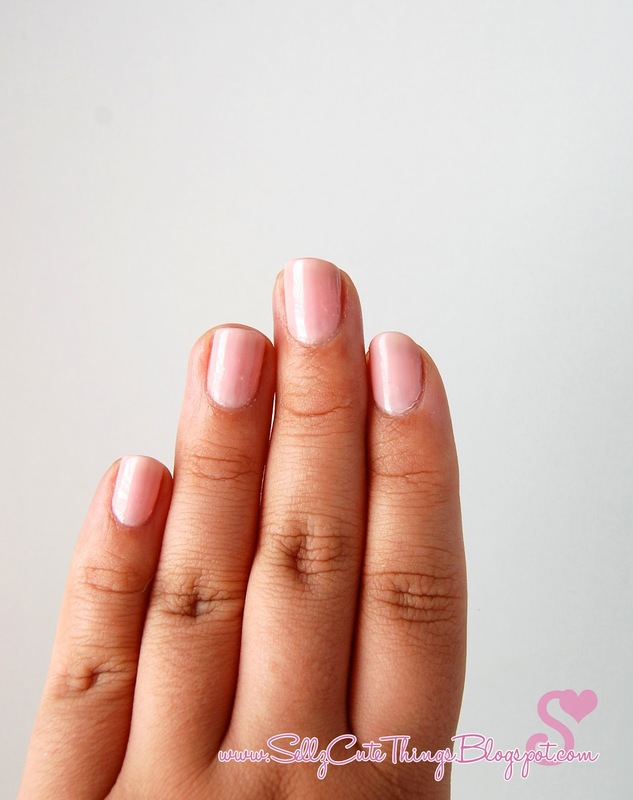 Paint your nails with the base color you chose. Let them dry completely! This is important because you avoid smudges. Punch out your shape with the hole puncher. 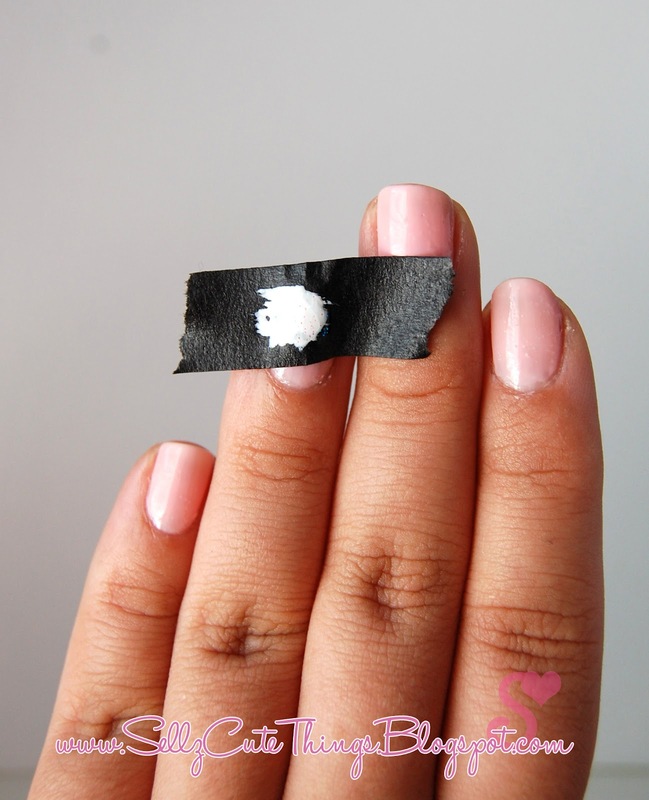 It may be tricky because of the stickiness of the tape, just be gentle when tugging. 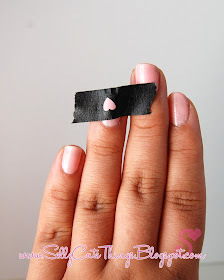 Then attach the tape to your nail firmly, you want to prevent the polish from bleeding. Apply polish over your shape. Gently pull off the tape before it dries. Be fun and creative in this step, add dots, glitter, leopard print anything that comes to mind in this step. 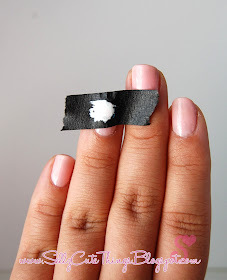 Its easy to do it because the masking tape is covering the nail and its almost impossible to mess up! I stayed simple for this tut. Apply your top coat and you're done! Here is a close up look of the heart with the glitter. What is the base color you use here? Stick the tape to your pants a few times. It will be less likely to muck up your paint but will still stick nicely. What is the top coat you use? I am looking for a top coat that'll help the manicure last longer than a day! Seche Vite is an awesome top coat I just discovered. It's awesome! I agree 100% with Janine! I use Seche Vite. I actually havent been able to pick up a new bottle and am stuck using some other brand and my mani's only last one day. Definitely get Seche Vite. I've found the OPI Top Coat to be great. My last mani lasted for 10 days before it chipped. I've just received some Seche Vite in the mail that I got really cheap online, so I'm going to try that for my next mani, though. Everyone on the net raves about it. welcome! Glad you like it. adorable, and brilliant. Stencil great! 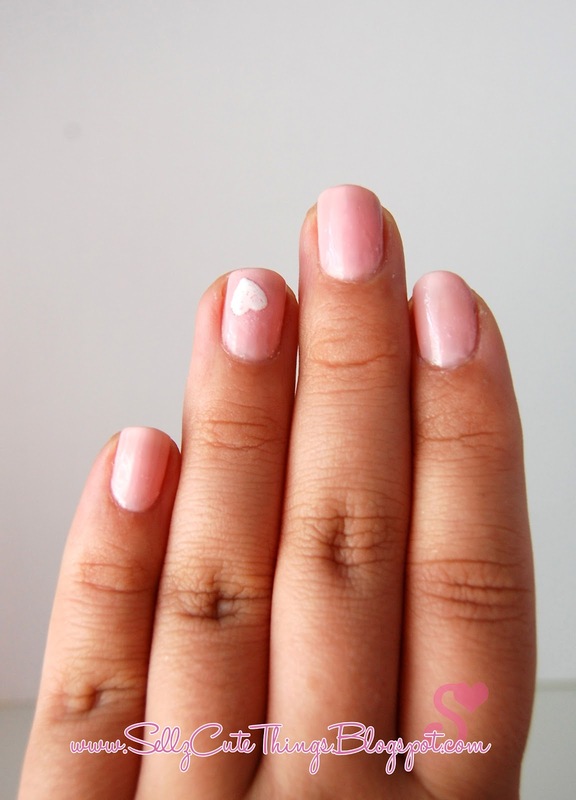 Simple and cute! I love it! Hi, I love this idea...it's great! However, I'm having trouble finding a hole punch small enough. I've gone to several craft stores & the heart punches are way to big for a nail. Please help! Where can I get small hole punches small enough?? Thanks for the tips & help. I found mine at the local discount store. I have also seen them at local dollar stores. As Anonymous stated below I am sure you could find some at local craft stores. If you STILL havent found one send me a private message via email at Sellz@SellzCuteThings.com and I will find out if my local store still has them and send them to you. Jasline, I found a heart and a butterfly small hole punch at Hobby Lobby. I am so happy you like my blog and the tutorials! Unfortunately I do not know where in the UK you could get these. Here is the link to the one I bought http://www.fiskarscraft.co.uk/Products/Craft/Punches/Hand-Punches (I used the UK as my region, so hopefully that means they are sold in some craft stores?) A quick search on ebay brought up some hits too. Sorry I cant be of more help. I went to the website you listed. What size heart punch did you use? Thanks. Here is a link to the line of punches I used. Maybe your local craft store carries them? Is there anyway that you can do this but without any hole punches? I really don't want to use those. I'm always looking for good designs and this is definitely one to do! Unfortunately, I've only got 2 different nail polish colors. I have not been ale to buy anymore. So I guess I'll just try some small design. Thanks for posting this! I really like it! I've seen this on Pinterest and I am DYING to try it but I am having a really hard time finding a small heart hole punch. Is the Fiskar hole punch the one you used to make the heart size in the pictures, or was it the dollar store one. I can most certainly order the Fiskar one but not the other. Hi Tiffany! 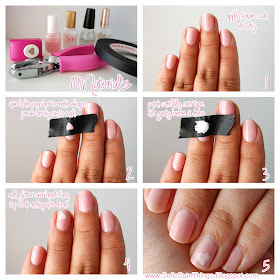 I am glad you are so excited to try using this technique on your nails, I promise you will love it and find it really easy to do. The hole puncher I used is the Fiskar hole punch, I found it at the dollar store but it is the same one I linked to in the Fiskar site. I bought the smallest size. Hope this helps untangle an confusion! Feel free to contact me again should you need too. Totally luv the tip! thankz!!! Try using a stencil for your shape, trace it on plain paper, reduce it to the best size using a copy machine, attach it to the top of the paint tape with clear tape, and cut it out carefully using an exacto knife. It takes more time, but you cam make any shape you want, and reuse it several times. This is a little irrelevant, but what is the pink thing in the background of the last picture? I recognize the white frame you use in other blog posts (The cute one from IKEA), I have that one, but I LOVE that pink thing! I am obsessed with that 'filigree' type border on stuff lol. are all the mini hole punches small enough for nails? 48 Pcs Trendy Nail Polish Nail Lacquers Combo Set + Free 5 Nail Filers.. So cute. Perfect nails art pattern making DIY tutorial.